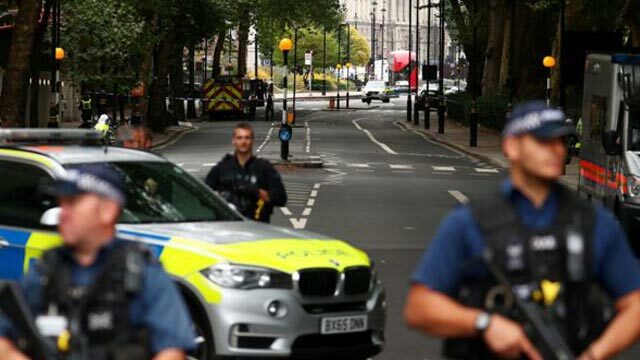 London, Aug 14 (Just News): A man has been arrested on suspicion of terrorism offences after a car crashed outside the Houses of Parliament, injuring two people. Officers were seen surrounding the vehicle before the man in his late 20s was detained, shortly after 07:30 BST. Cyclists were hit in the crash and London Ambulance Service said it had taken the patients to hospital with non life-threatening injuries. Scotland Yard's counter-terrorism unit is leading the investigation. Armed police, ambulances and firefighters are continuing to respond to the incident in central London. A number of eyewitnesses have said the silver car appeared to deliberately hit members of the public. BBC News home affairs correspondent June Kelly described the terror arrest as a "significant development". "The police will be looking at this man's background, his identity - they'll either know it or they will be working towards it," she said. "They will be looking at his beliefs his associates, also his mental state. "Also, crucially, is he on their radar - is he somebody who was known to them?" People have been moved further back from the area twice as police put up a Terrorism Act cordon, officers at the scene said. Parliament is currently not sitting. Barry Williams, a BBC member of staff based at Millbank, said: "I heard lots of screams and turned round. "The car went onto the wrong side of the road to where cyclists were waiting at lights and ploughed into them. "Then it swerved back across the road and accelerated as fast as possible and hit the barrier at full pelt. "It was a small silver car and he hit it at such speed the car actually lifted off the ground and bounced. "Then the police just jumped. Two officers managed to leap over the security barriers and then the armed police vehicles all sped towards the scene." Jason Williams told the BBC Radio 4 Today programme the driver had "driven at speed - more than 40 mph". He added: "There was smoke coming out of the car. I have seen people on the ground, lying on the road. I don't know if they have actually been hit by the vehicle or not. "I saw at least 10 people lying down. I was told basically to move away, to run. I have run for my life."